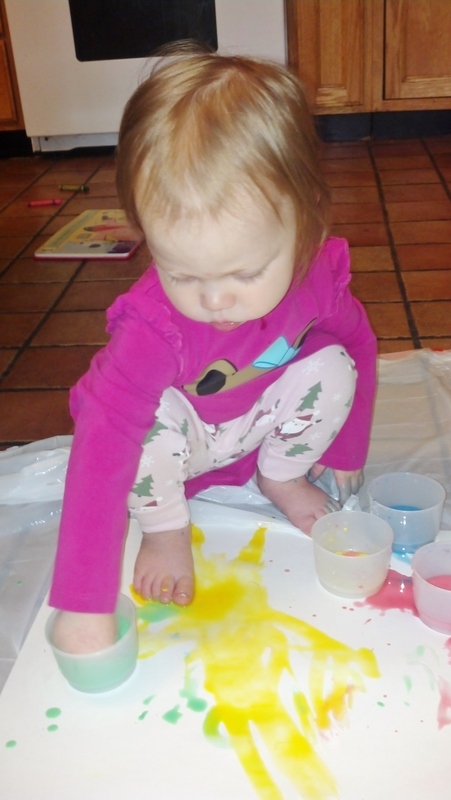 Toe painting is a fun and messy way to create a wonderful piece of process art. When the nice weather hits, we head outdoors. 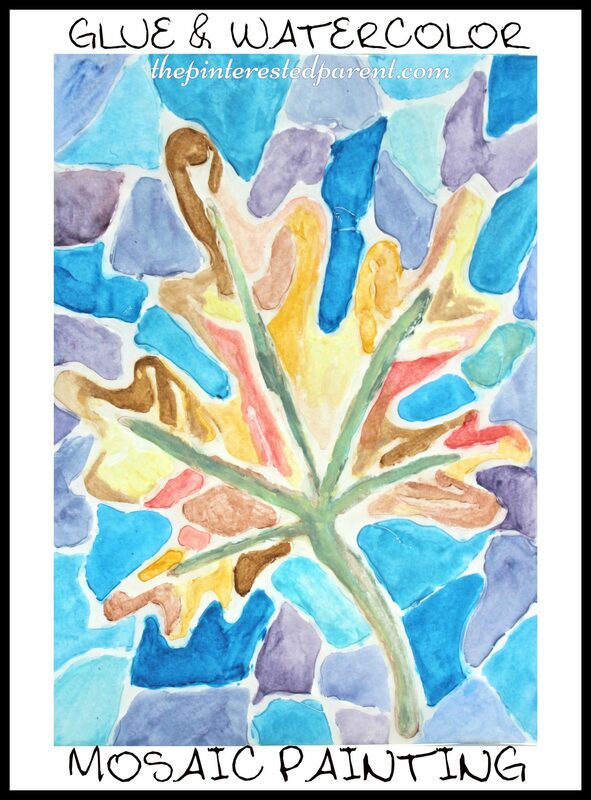 Our days are spent playing in the yard, going on hikes and creating art. 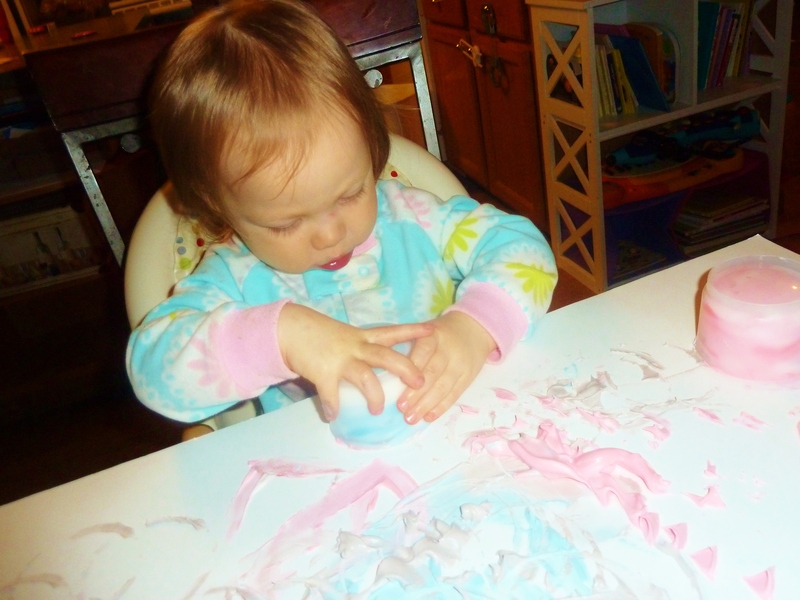 Warm weather means that we can start getting messy with the paint and chalk. We love to bring our craft roll (affiliate link) outside and lay it on the driveway and paint in the sun. It all started rather normally. We gathered our paints and brushes and went outside. One of the paint brushes started to roll down our driveway. I stopped it with my foot and grabbed it with my toes and then ding ding ding, we decided to get a little silly. Easter is only a week away. We have been shopping & preparing for the holiday. I have a ton of plastic Easter eggs lying around waiting to get filled. I should rephrase that, I had a ton of plastic Easter eggs. 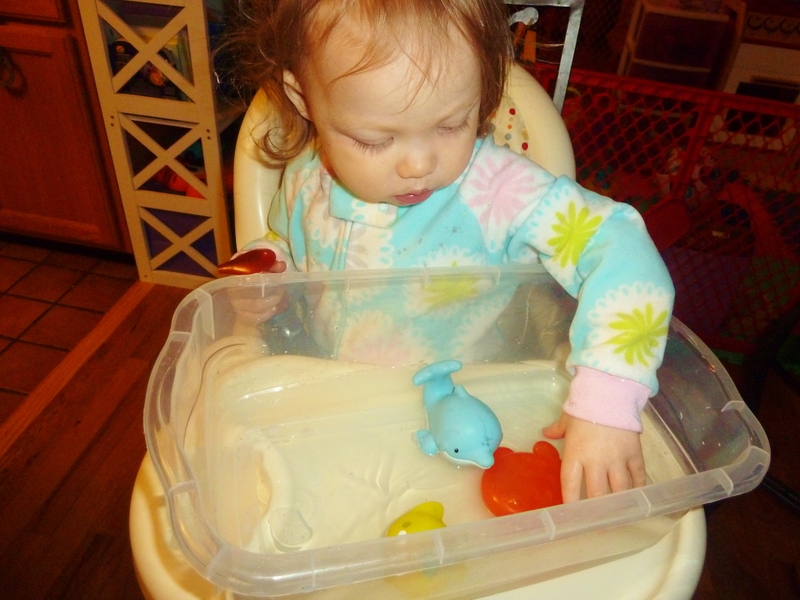 My daughter has been slowly depleting my supply & using them in her play kitchen. She pretends to crack them open & throws the empty egg shells in the trash. I had to give her a pretend trash because she was throwing them away for real. 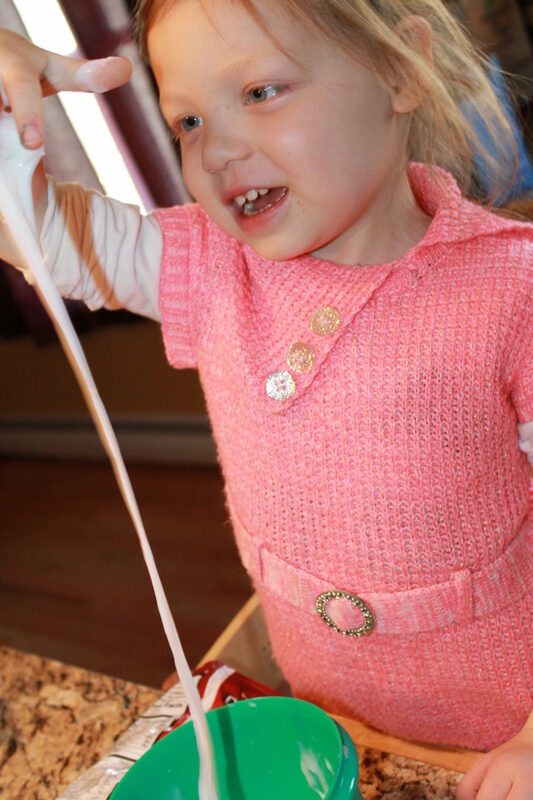 She take pretend play very seriously. 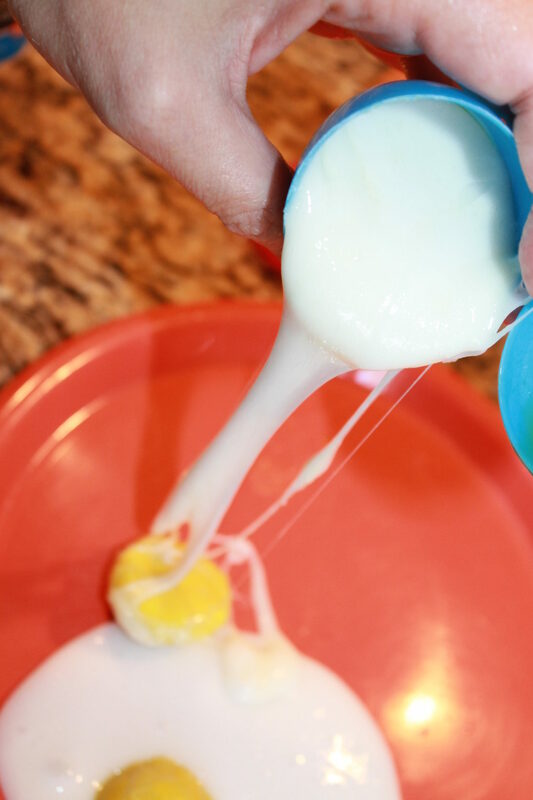 She has been having a lot of fun mixing up her air eggs, but since she likes the realistic, I thought we could add a little something extra to her pretend egg scrambles. Here is what we did. 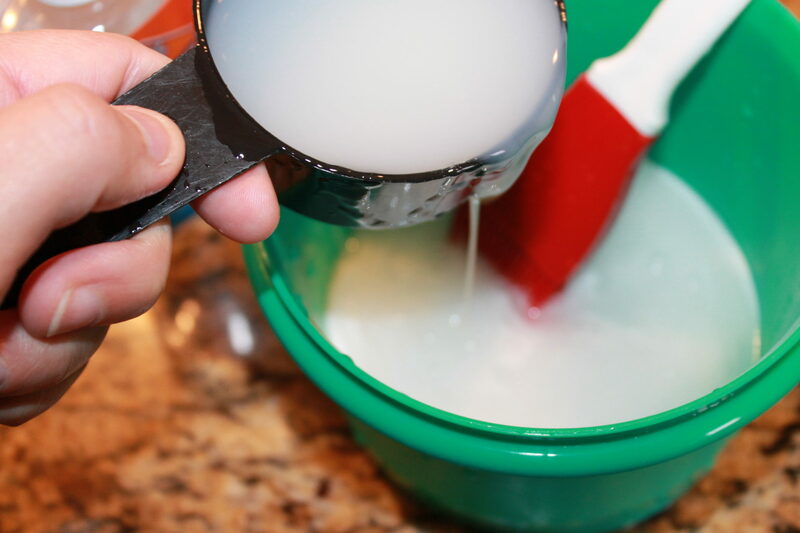 We made up a quick batch of slime. 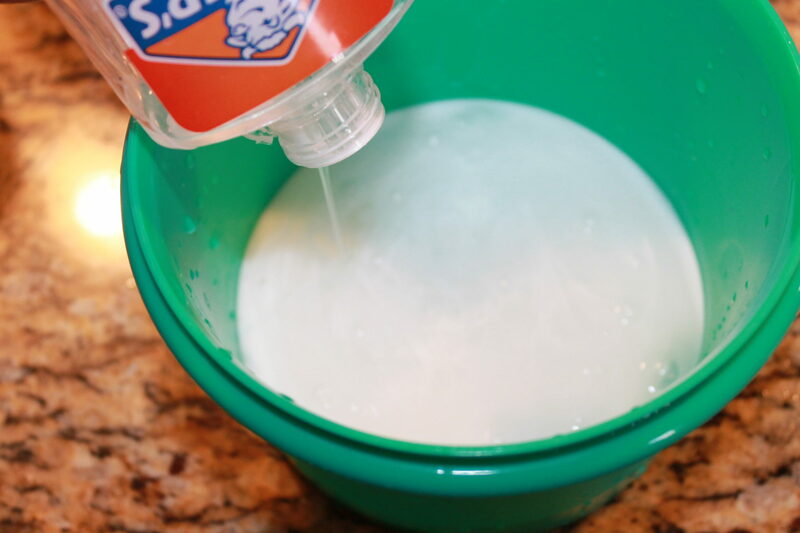 Directions: Pour all of the glue into a bowl. 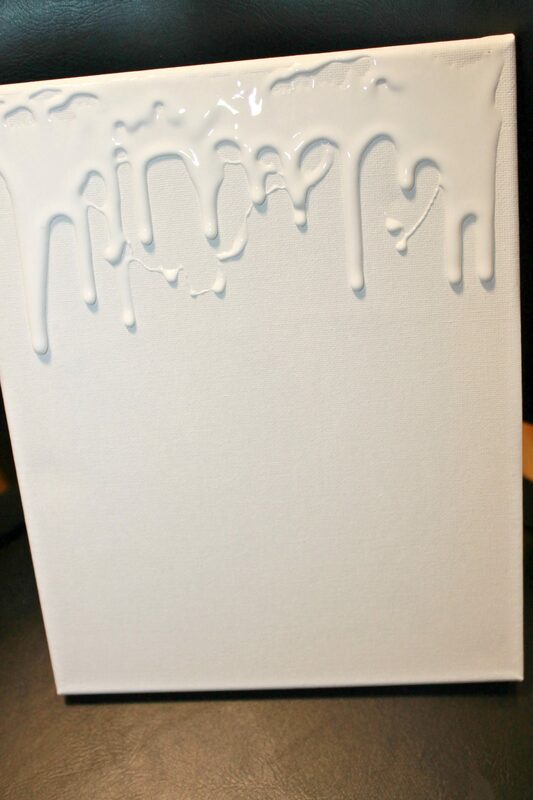 You can use all clear or all white glue, but to achieve the look I was going for I used a mixture of half & half. Add the liquid starch in very small increments at a time. Stir it well as you go. It will thicken quickly. Be careful not to add the starch too quickly. When it gets to thick to stir, you can use your hands to knead it. I used just shy of the 1/2 of liquid starch & then added spoonfuls of water at a time until I achieved the consistency I was looking for. My daughter helped. 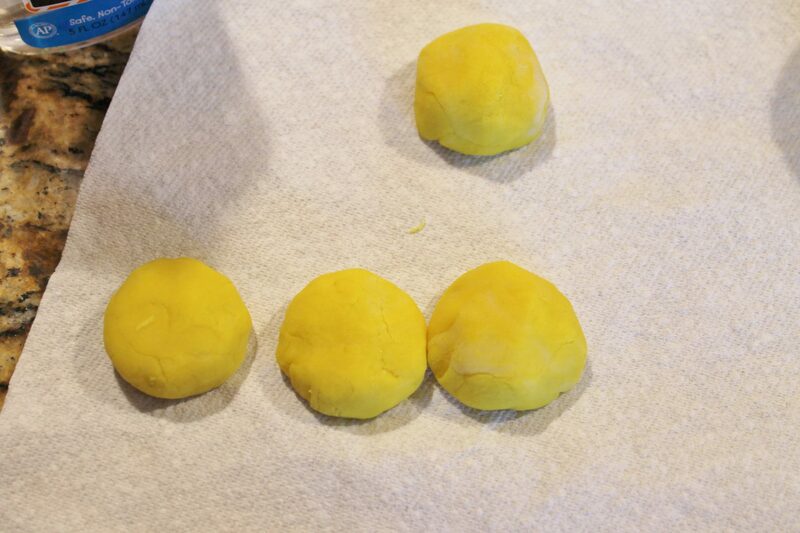 Use the Play-doh to form little yellow balls for the yoke. Flatten them out a little with your hand. 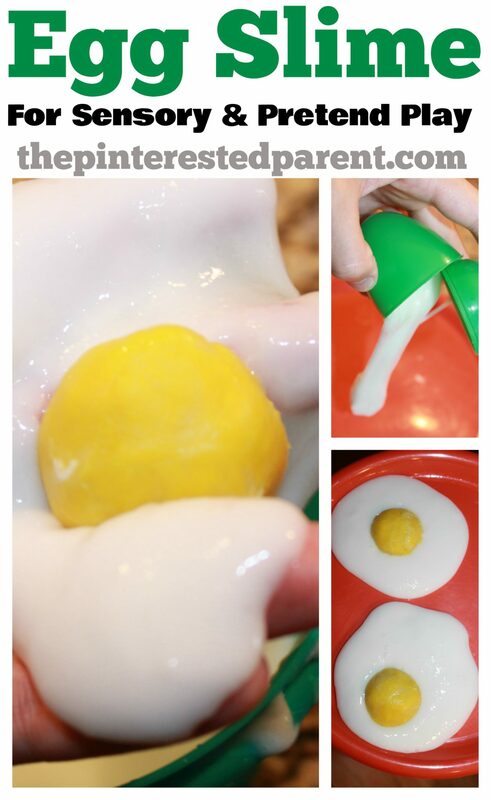 Grab a handful of your slime & add a yolk to the top for a realistic looking sunny side-up egg. 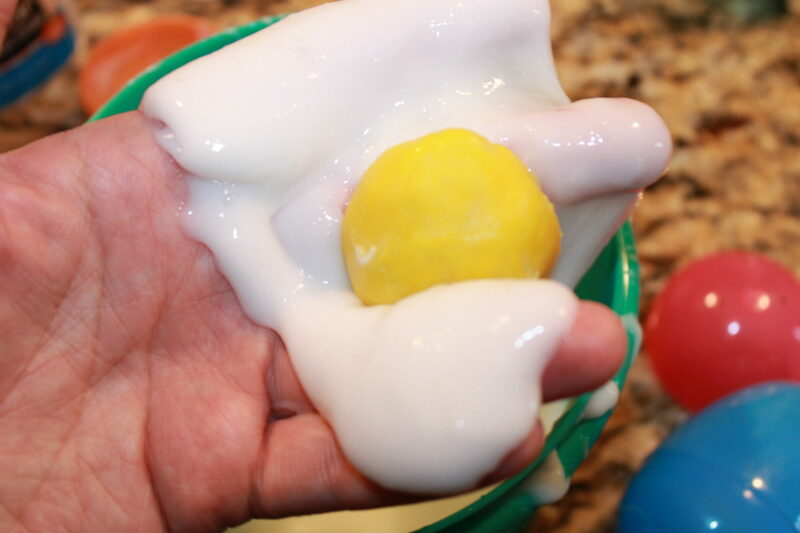 Or you can put the slime & yolk into an extra-large plastic egg for a fun egg cracking experience. My daughter thought that this was hilarious. “Mama, it looks like real eggs.” It turns out that just like with regular eggs that she does not like the yolk, so she pulled those out & just played with the whites. Like I said, my daughter likes to keep things realistic. Visitors often giggle as they walk into our front door. The reason for the chuckles is probably that they are greeted by a giant cardboard house surrounded by a play kitchen and piles of children’s books. If you look around our house there is very little proof that there are adults inhabiting it. Our coffee table is a Play-Doh crafting workshop. Our DVD cabinet is filled with Mickey Mouse Clubhouse, Mary Poppins and several Disney classics. The decor hanging on my walls are made out of paper plates & toddler hand prints and the crafting supplies that made them are scattered all over our kitchen island and dining room table. Most of our home has been branded & claimed by our little girl. That is alright by me. 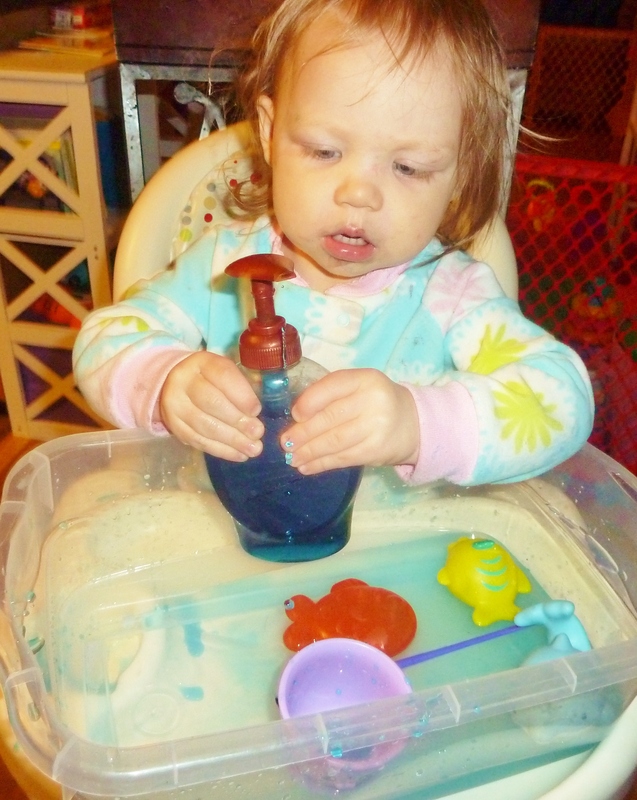 That messy pile of clay on our table expands that beautiful imagination of hers. Those DVD’s have brought comfort & cuddles when my daughter has been ill. Those crafts have given us hours of bonding and smiles. Our home is a happy one, unkempt, cluttered and filled with Play-Doh, toys and love. Still, I do sometimes miss the memory of a tidy home. I might not have that clean space anymore, but I do have one comfy little nook that is all mine. After our daughter has been tucked in to bed for the evening & my husband has passed out on the couch, it is time for me to retire to my favorite spot. 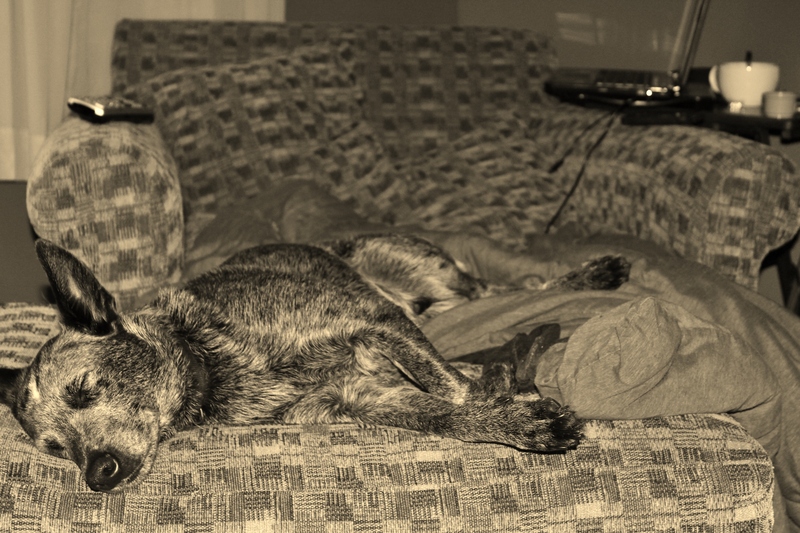 Duke keeps my seat warm for me until I get there. I snuggle in with him nuzzled up at my feet. This is my time. This is where I unwind, reflect, and work on my favorite outlet, my blog. My space is not much. The cushions are flat & worn. 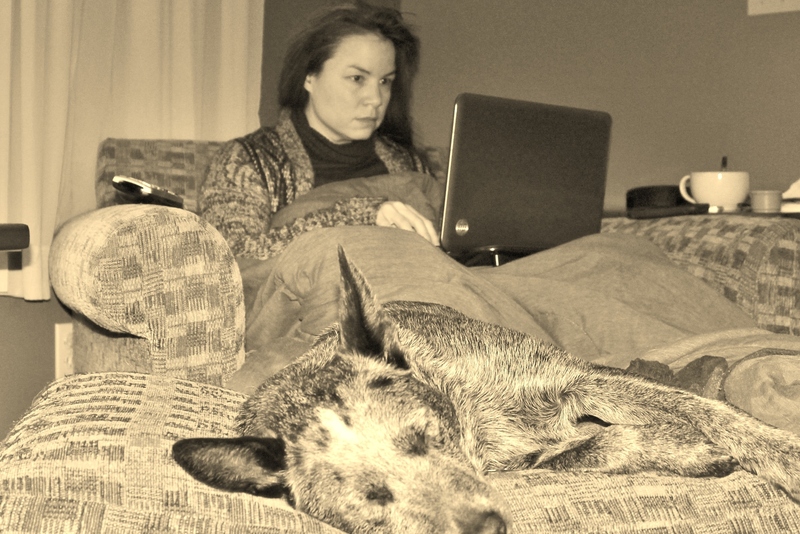 There is dog hair everywhere, but on my chair with my laptop laid across my legs, I have shared many funny stories, ideas, crafts, recipes and thoughts on being a mommy. Sure, I could have a home office with a fancy desk and a PC like we used to, but we gladly traded that in for a crib and changing table. Who needs a desk? This is my office. 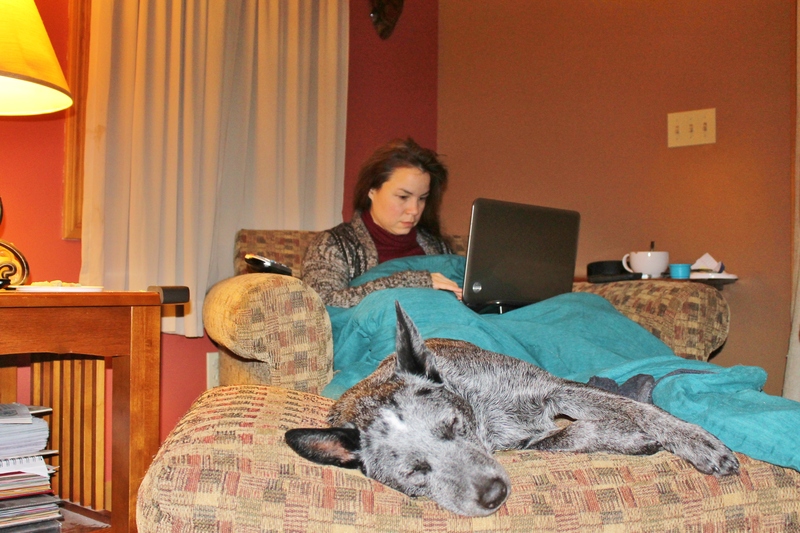 Do you have your own cozy work space? Please share with us. Check out WeWork & check out some other creative work spaces. WeWork is a co-working company that aims to inspire creative people to do what they love. So… If you’re interested in learning more about WeWork checkout some of their locations to see if they are in an area near you! 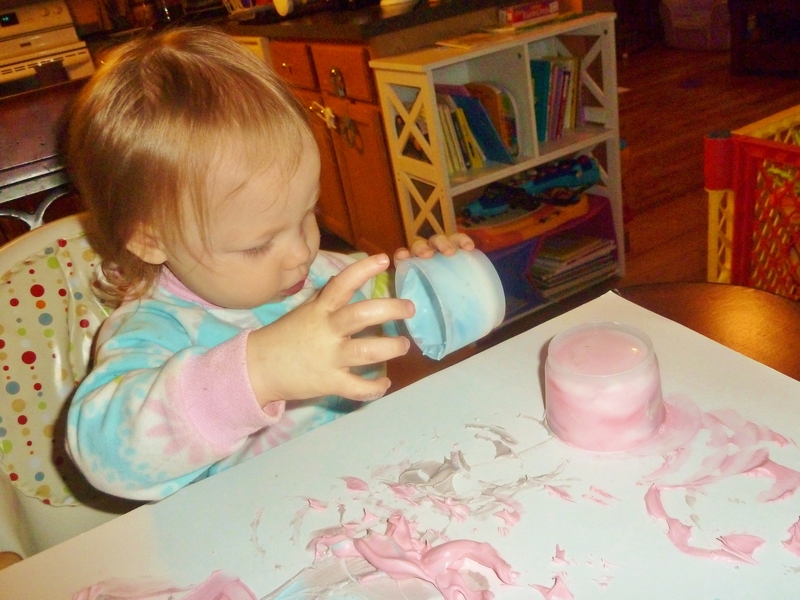 As any mother of a toddler knows, toddlers have a short attention span and like to keep busy constantly. They are discovering and learning something new every day, every minute, every second. It is an incredible to thing to watch. It can be uplifting, amazing, funny, heartwarming, frustrating and oh so tiring. 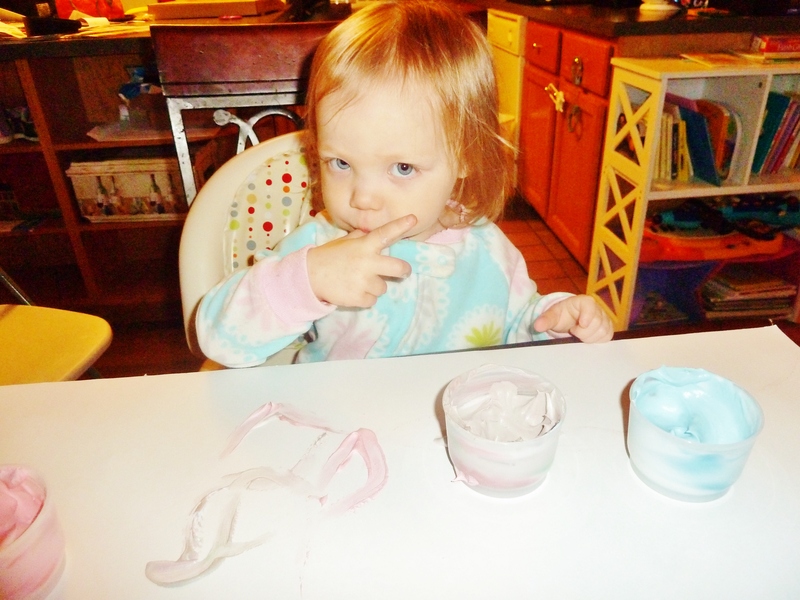 It can be extremely difficult finding activities that will engage & hold my daughter’s interest. She, like her father is a runner. She does not like to stay still even for short periods of time, which is the reason I think I have such a hard time getting her to eat her meals. 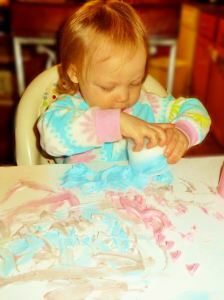 One thing my daughter does like is finger painting. Like most children her age she also likes to put everything in her mouth. 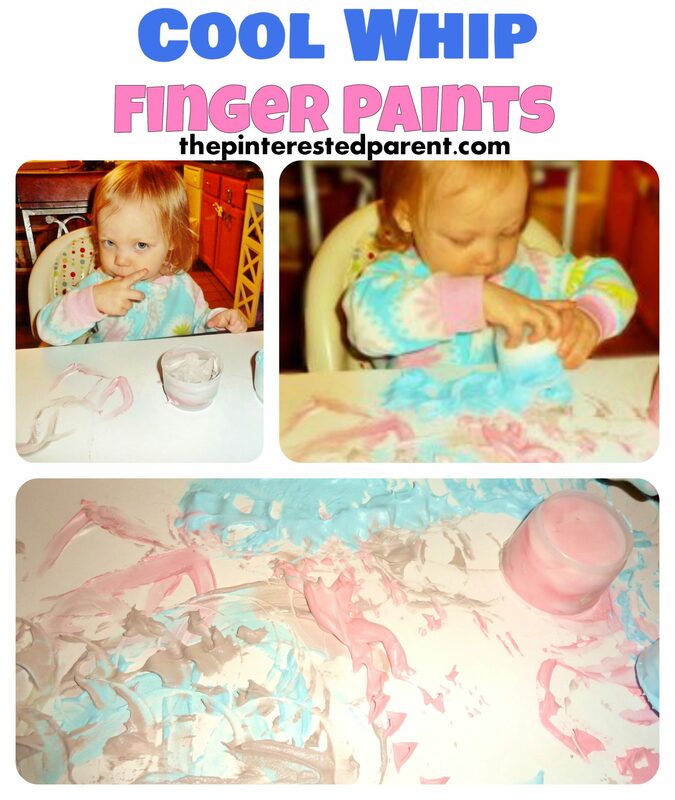 I found this recipe for edible finger paints last year on Pinterest. I have made these several times. Here is Mai hard at work. 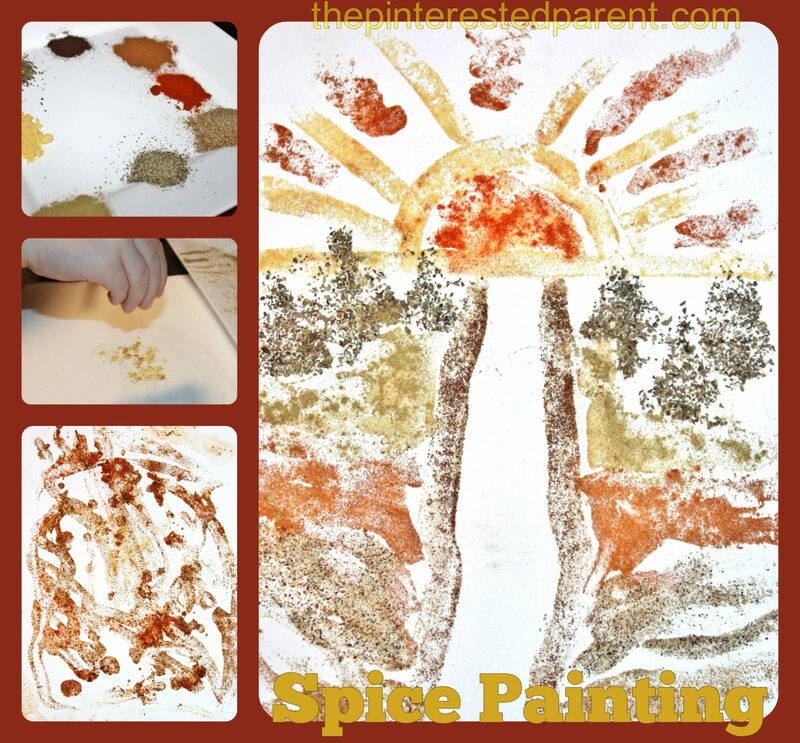 This is a great recipe but I found that with this and with other finger paint recipes that they were too soupy. 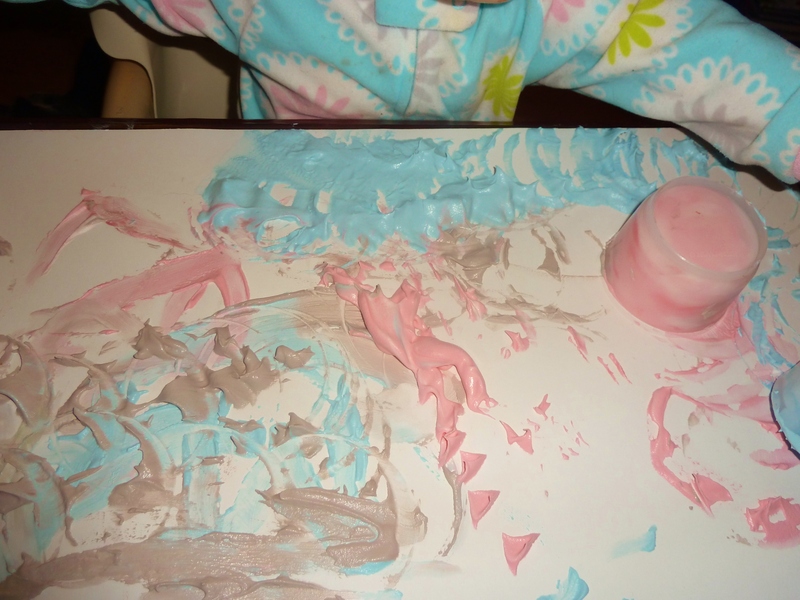 She would pour out her paint containers within minutes, and that would be end of that. I saw another idea for playing in shaving cream and I thought this was a great idea but I didn’t want her eating it. 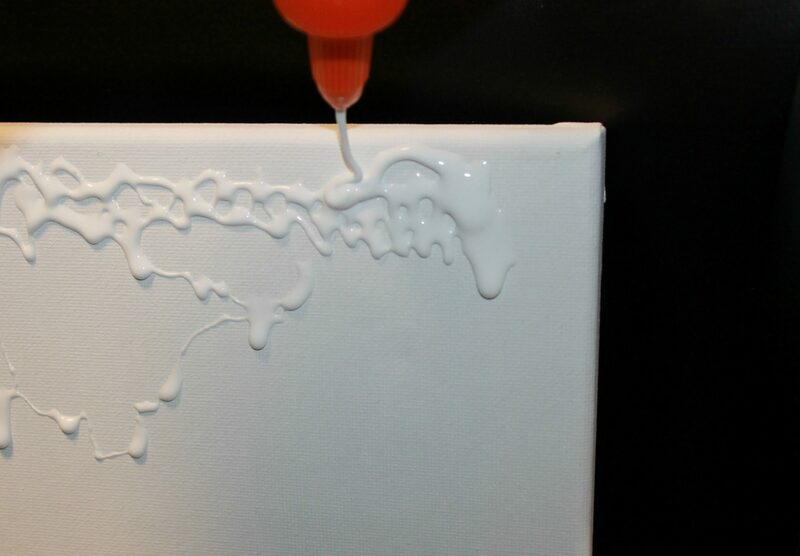 The image of the shaving cream brought to mind Cool Whip. Lucky for me I always have a tub of Cool Whip handy. 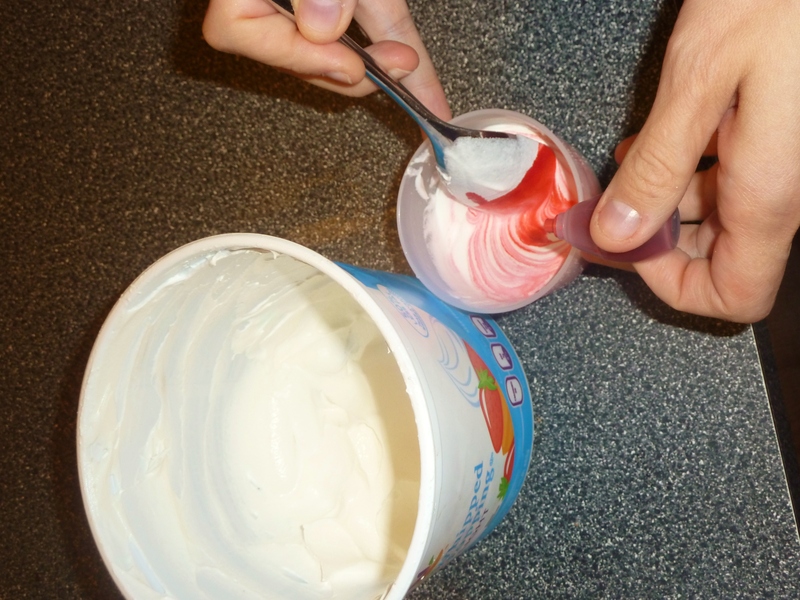 I portioned out the Cool Whip into 3 containers and added food coloring and stirred until I achieved the desired color. Mai was curious about it right of the bat. 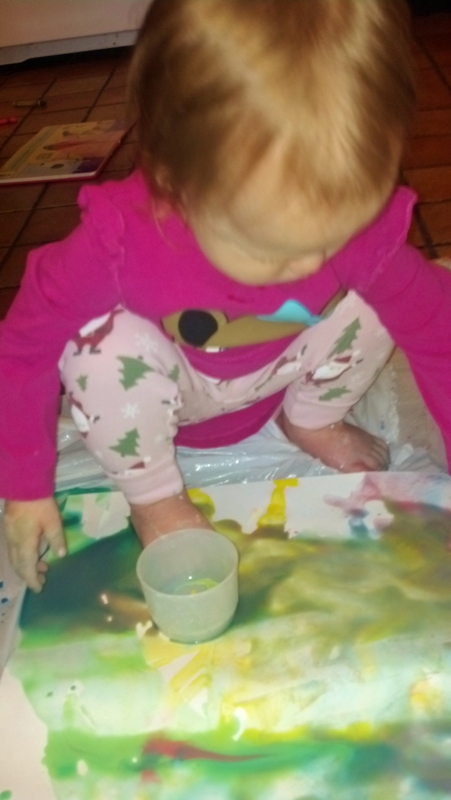 I set up her painting area by putting down a drop cloth under her chair and set a piece of poster board down for her at the kitchen table. Let the paint fly, Mai! She, of course, had to start off with a taste test. It passed with flying colors, now she is ready to paint. 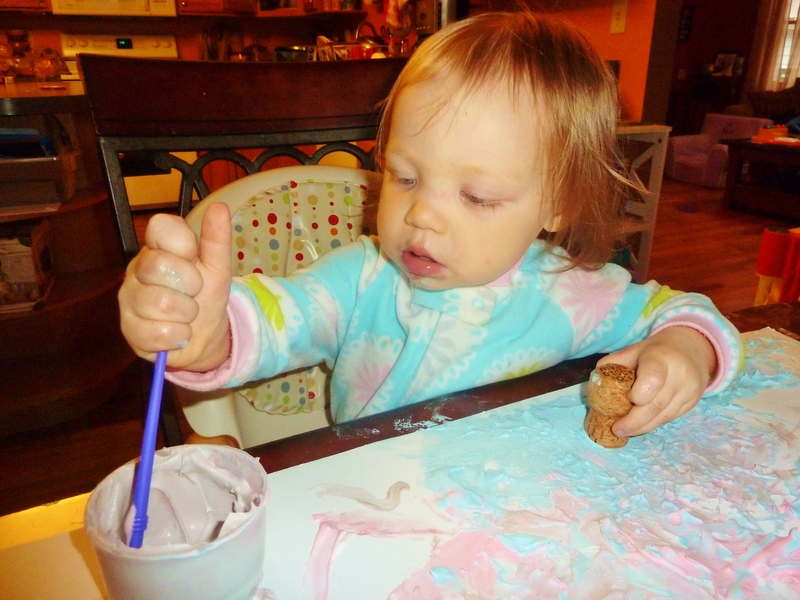 I gave her a cork and a paintbrush to work with. I was impressed with my little Picasso. 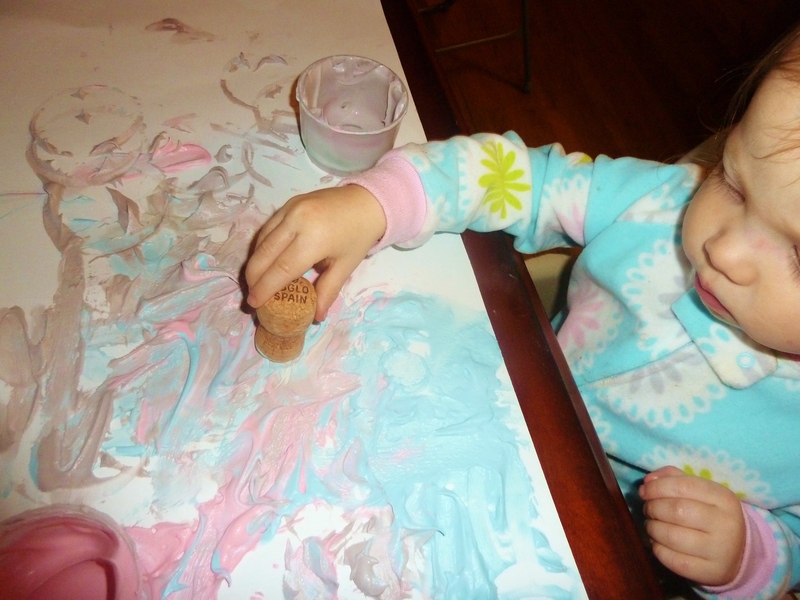 She used the brush to paint the cork and then used the cork to stamp the paper. 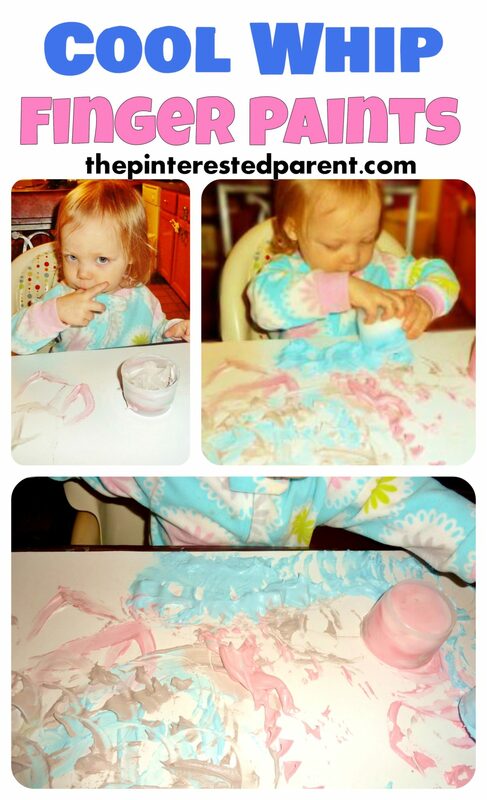 The Cool Whip paints worked wonderfully. 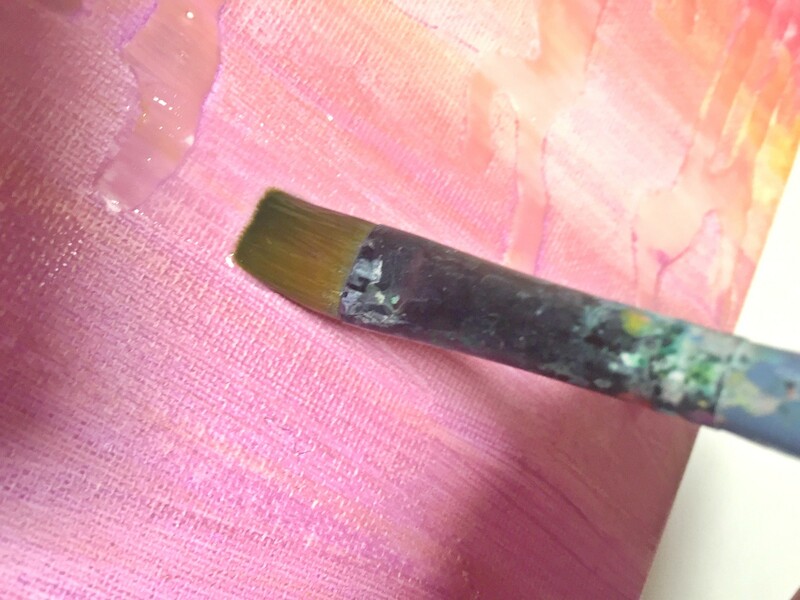 The denser texture made for a better contained mess & it was much easier to mix than regular finger paints. It tastes better too. Mai loves playing with liquid. 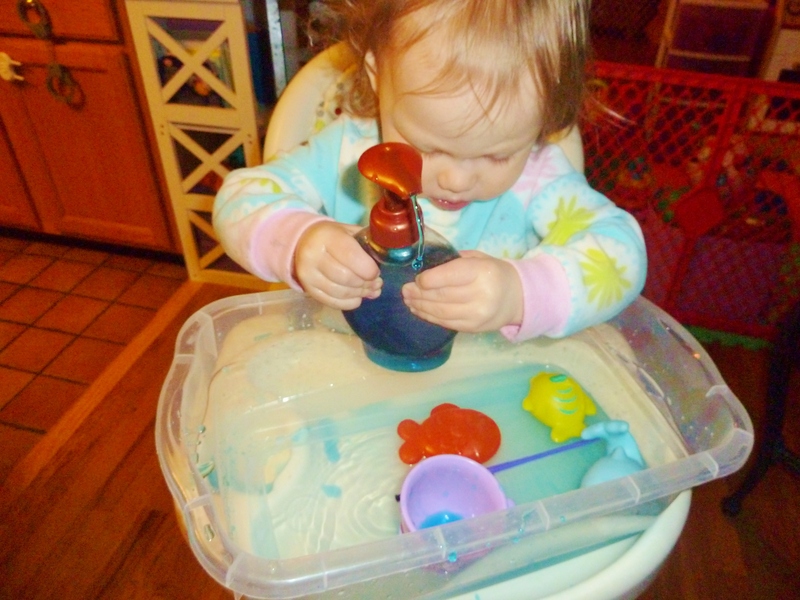 One of my daughters favorite things to do is to take her sippy cup and pour her juice, milk, etc into anything she thinks will hold it. I have caught her taking random toys and putting them in her play pots and making soup out of them. Here is another simple activity. Leave the splash mat out. I used a small Rubbermaid container and filled it halfway with food colored water. 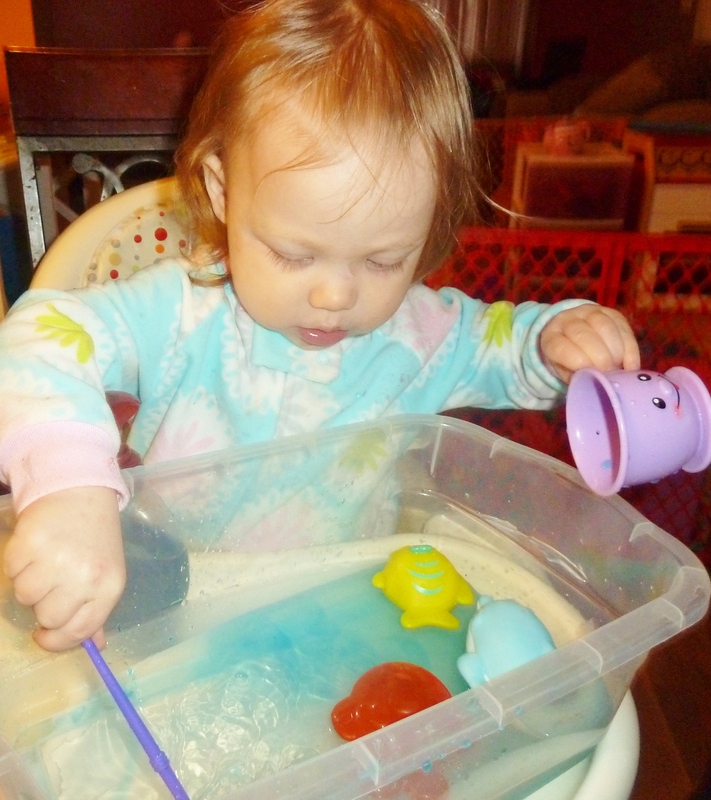 We added some play cups and bath toys. 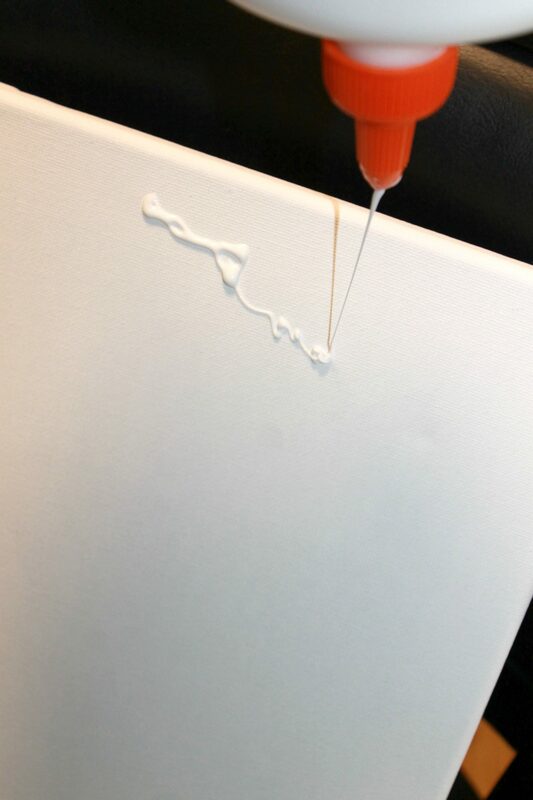 She held on the the paint brush, too. She became really attached to it. I also gave her a pump bottle filled with the same colored liquid. She loved this. This one was a winner. 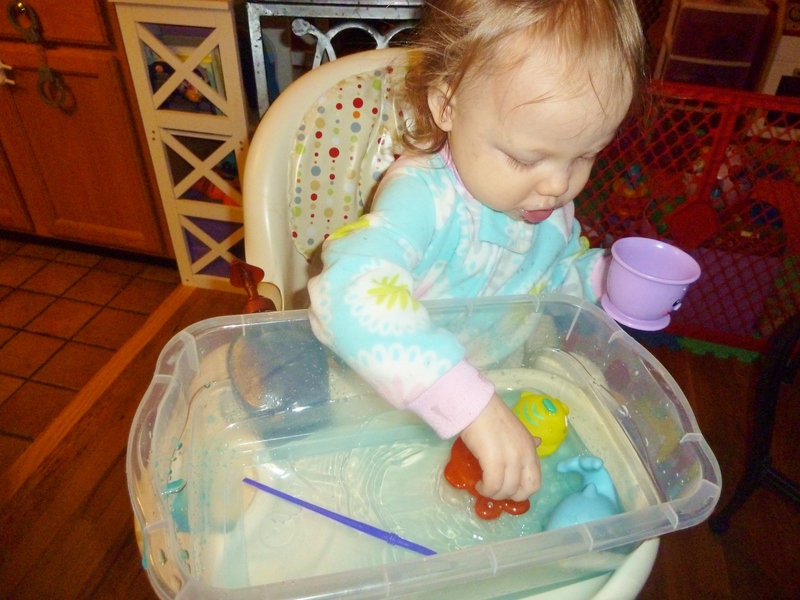 I was able to cook a whole dinner while she enjoyed her water play. Thank you, baby.